This recipe makes approximately 30 carrot and lentil hearts. 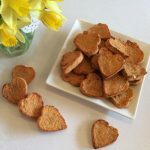 They can be frozen so are perfect for making in big batches to have as a handy snack! Harry loves cheese! Anything that has cheese in it he will demolish! 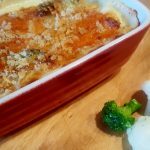 This cauliflower and broccoli cheese bake is a great way to get vegetables into Harry when he is going through a fussy phase! 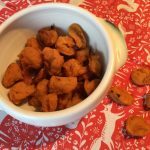 Sweet potato and apple bites are really easy to make and soft enough to melt in the mouth, perfect for younger babies but were also enjoyed by my toddler as a snack! Harry loves cous cous! It is so small and tricky for him to eat though that it usually ends up turning our kitchen into a couscous snow globe! 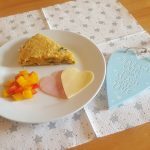 It’s amazing how far a tiny piece of couscous can travel when it is thrown by a baby! 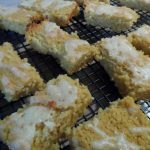 These couscous fingers are a brilliant solution for how to give couscous without the mess and inevitable frustration caused by it slipping through baby’s fingers! 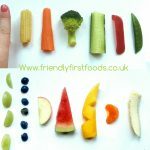 Finger food size guide and a really useful banana hack!